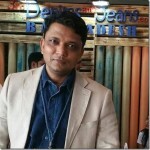 Wrangler recently announced the adoption of Foam dyed indigo fabrics to be used in their jeans. The fabric is to be made at the Spanish denim mill Tejido Royo and will be shipped , starting from December , to Wrangler’s garment vendors globally . So what is Foam dyeing and why is Wrangler adopting it ? Late last year representatives from across the apparel industry gathered at the Fiber and Bio Polymer Research Institute of Texas Tech University for the reveal of a disruptive, new foam-dyeing process for producing denim. Early stage investors, including Wrangler, Lee and the Walmart Foundation were on hand for the event, hosted by Indigo Mill Designs (IMD). 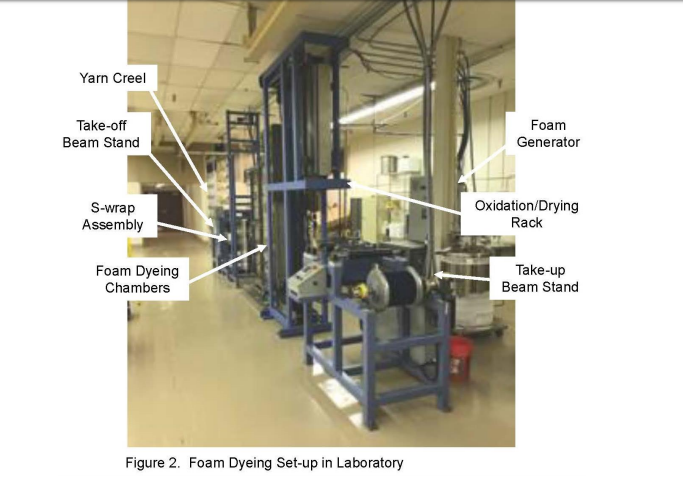 An article by R.Tharpe of Indigo Mill Designs(North Carolina) , D Etheridge of Fiber and Polymer Research Institute (Texas) and H Malpass of Denim Dyeing Technical Service LLC – the creators of this technology – is quite indicative of how this process works . We bring some excerpts from the article, the complete article can be downloaded here . The continuous Rope dyeing system was introduced in 1921 and there are vat boxes for indigo dyeing . There are seldom less than six such vats, with up to twelve being common. Sizes of each one of these range from 500 to 1,500 gallons of fluid capacity. These are accompanied by a multitude of guiding rollers and multiple 5,000-to-10,000-gallon storage tanks. The footprint on a factory floor may be 100 meters long. In addition to being a slow-moving, water-intensive technology producing large amounts of salts, the dyed ‘ropes’ – consisting of about 400 individual yarns – must be re-beamed (separated into individual yarns for weaving). This is a slow, tedious task that is very labor-intensive. 1. A purge chamber that removes oxygen from the yarns before going into an application chamber. Among other things, this contributes toward eliminating the use of sulphur reducing compounds. 2. An application chamber that precisely controls the delivery of foam-based dye liquor to deliver the dye liquid from the collapsed foam in a manner that enables control of dye uptake and penetration. 3. A kinetic chamber that modulates the dye absorption to minimize the amounts of detrimental surface indigo and wasted indigo, enhance the darkness and purity of the blue, and improve the color fastness. The yarn handling system was designed to deliver 40 yarns from a small beam through the dyeing system and rewind the dyed yarns onto another beam. It provides computerized control of yarn tensions from beginning to end. It was designed to reach a maximum speed of 100 yards per minute (ypm). Added to the system is a creel with computerized control of yarn tensions, so that yarn packages can be fed directly into the yarn handling system. Fabrication of the foam generator and the three-stage, anaerobic foam dyeing system was contracted to Gaston Systems2 . It delivers precisely metered foam directly to the 40-yarn sheet as it passes over a sequence of rollers. It is coordinated by computerized feedback with the yarn handling system, so that constant yarn tension is maintained throughout. It enables real-time adjustments for foam blow ratios and wet pick-up levels. It also automatically adjusts these variables if the speed of the yarn movement is adjusted.The system was completed by the addition of an oxidation and drying rack between the kinetic chamber and the yarn take-up beam. The yarns need time to oxidise before drying, because moisture is necessary for oxidation to occur. Fortunately, oxidation occurs quite rapidly and the design of the rack is adequate even when running at maximum speed. However, the infrared drying capacity we used is generally inadequate when the yarns are running faster than 40 yards per minute; therefore, it is being increased. The image above from the article shows a demo setup of dyeing – which of course might be bigger when it comes to larger scales. Effective dyeing is obtained on yarns taken from spinning machines. Thus, the costly and water-intensive pre-treatment of yarns required with the traditional technology may be eliminated. Dyeing is efficient at speeds between 20 and 100 yards per minute (ypm); therefore, since the yarn handling system does not run faster than 100 ypm, a maximum running speed is not yet known. Keeping the oxygen content below a threshold is critical to the shade and dye fastness. This is true in both the application chamber and the kinetic chamber. Effective dyeing on most yarns may be achieved at moisture levels that leave the yarn just damp to the touch, which require a small amount of heat to dry. The flexibility of the system enables control of dye placement within the yarns to greater extremes than is now possible with conventional technology. The system also allows changing variables like dye concentration, blow ratio, and wet pick-up in real time, without stopping the dyeing run. Both pre- and post-washing is eliminated from the dyeing process. Dyed yarns are immediately available as inputs for downstream processes in fabric formation. The elimination of dye baths and the consistency of the applicator/yarn interface have potential to eliminate shade differences when going scaling up from a smaller sample fabric width to full-width fabric. The technology looks very promising and may have significant impact on denim production if it is successful – leading to a high degree of sustainability in denim fabric production. We are looking a slew of new technologies working towards sustainability coming up in recent years. Many of them have been successful and some have not been. Early adopters , of course have a risk, but also a big chance of success in the current scenario where awareness on sustainability is on the rise. We wish for industry’s sake, that such technologies should succeed !